The male caught my eye when he flew to the tree and upon closer inspection, I saw his mate in the lower right of the photo. Temps in the upper 70's to start and mid 90's at end, mostly sunny with light winds and higher than normal humidity. A relaxing hike today after receiving some much needed rain last week. The trails are still visible but, in places, not as "smooth" as before. This has been caused by the combination of a wet trail and large hooved animals, i.e., the longhorns, that walk on it while it is muddy. The mud dries and what was once a smooth surface is now very bumpy. Hikers will be concerned because it is easier to twist an ankle, bikers will experience a rougher ride and equestrians will have to watch where their horses step. 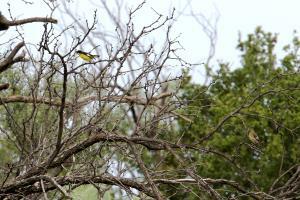 Saw a pair of Lesser Goldfinches (photo attached) as well as many Scissortails and other birds. Six whitetails of various sizes bounded out as I hiked and at Shady Trail, fresh evidence there is still a beaver bringing down trees. There were innumerable grasshoppers along the entire hike and while on the service roads especially, the humming of bees was LOUD. I didn't see any flowers but watched the bees gathering on all kinds of vegetation. The park has re-mapped their trail system and paper copies are now available. A word of caution - the paper maps do not correspond 100% with existing trail markers. The park is working to update the trail markers and it will take a little more time before there is a perfect correlation between the two. If in doubt, use the paper map. Water is available at the campground by Bell's Trailhead. Water, shade, info kiosk and dry toilets available at the River Bend Campground. CAUTION - dry toilets not maintained/serviced on a regular basis so watch for insects, reptiles and animals if you plan to use it. Water, shade and info kiosk available at the Dinosaur Tracks Viewing Area (approx 1.5 miles from Bell's Trailhead on Dinosaur Trail). First Lesser Goldfinches Seen this Year!